✔ SGS (Societe Generale de Surveillance S.A.) certification. ✔ Maximum load capacity 300 lbs (136kg), sturdy and durable. ✔ Adjust desk feet height, can be used for uneven ground conditions. ✔ Using 1.2mm inner wall which is more Strong, Durable, Steady. ✔ Easy to install, just need to install 4 legs with 8 screws. 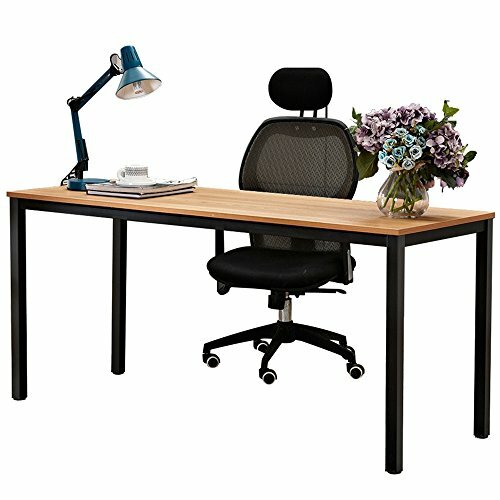 Tips: This desk is very easy to install, you only need to install 4 legs with 8 screws. If any problems please contact us, we will try our best to fix (The install tools come with the package). 【Dimensions】: 63.0L * 23.6W * 29.5H inch (160L * 60W * 75H cm); Package weights about 48.5 lbs (22 kg); Maximum load capacity 300 lbs (136kg). 【Health & High Quality】: The Plate: Solid wood particle pressing, E1 grade environmental wood without any industrial glue, and 0 formaldehyde release. Table legs are using epoxy spray paint process, and using 1.2mm inner wall (most desk frame's inner wall is 0.8mm). 【Reasons to Purchase】: Using double screw installation technology to improve stability, security; Come with height adjuster (1-2cm), also can be used for uneven ground conditions; Ultra-thick metal steel frame to provide the ultimate stability, and beautiful & durable paint. 【Elegant & Decent & Steady】: Modern simple fashion, elegant and decent appearance provide comfortable working environment. Very easy to install, you only need to install 4 legs with 8 screws.